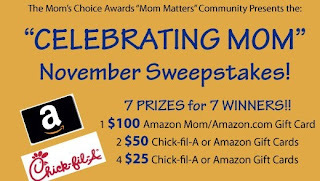 Enter to Win 1 of 7 Amazon or Chick-fil-a Gift Cards! $300 in Prizes! Mom's Choice Awards is having a great sweepstakes right now with 7 winners! Hurry and enter because it ends 11/27/11! Click here to enter...GOOD LUCK!